Penguins are birds that have lost their ability to fly and have their wings transformed into fins to be able to swim, which is why in antiquity they were thought to be fish. They have thick layers of fat that repel the water and insulate them from the cold. They also have a thick layer of feathers amongst which they hold warm air from their body heat. The fact that they have light bellies and dark backs is a camouflage system to allow them to blend in with the sunlight or the darkness of the bed when they are in the water. Young Humboldt penguins have silver coloured bellies, whereas adults have white bellies with an arched black strip. These birds nest in small colonies and build their nests in caves or holes. They feed on fish, squid and small crustaceans that form part of the plankton. 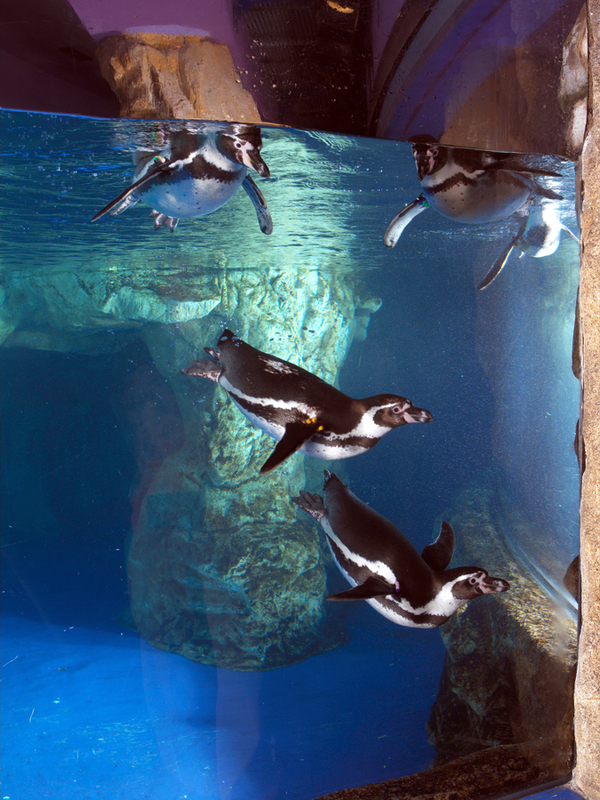 When they dive, the Humboldt penguins reach depths of 70 m and swim at 45 km/h. 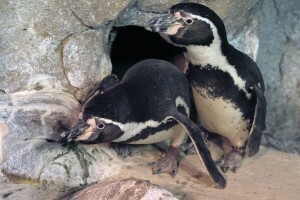 Penguins are monogamous animals, that is, they form stable couples. They have a single partner they preserve throughout their lives, building nests and laying 2 eggs they incubate for 6 weeks. It lives on rocky coasts and islands with cliffs. The Humboldt penguins lives along the coasts of Chile and Peru between 5 and 33º latitude south. A species considered vulnerable (according to the red list of endangered species). 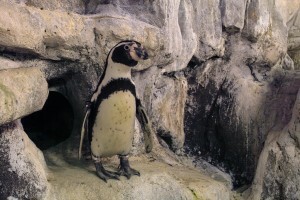 The sounds made by penguins remind us of donkeys calling. What do you think they are doing when they rub their beaks against their bodies? They do this because at the base of their tail they have a gland that produces a fat they spread on their feathers with their beak to weatherproof them and thus form an insulating layer that keeps the air warm between their skin and feathers.